The latest book in the acclaimed series of literary travel guides brings together a delightful sampling of short fiction from one of the world's most diverse, multicultural, and storied civilizations. 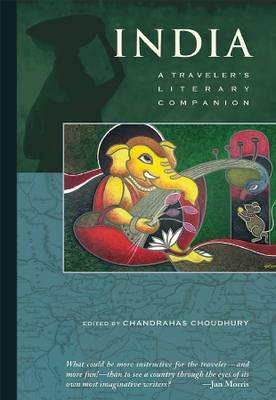 India: A Traveler's Literary Companion features 14 short stories from some of India's best writers, collectively offering an insightful portrait of the beauty and complexity of Indian landscape, culture, and society. Travel to the Taj Mahal with Kunal Basu, as the humble accountant of his story becomes, in another incarnation, the architect of one of the world's most resplendent monuments. Let Vikram Chandra leads readers by the hand into the ghettos of Mumbai (Bombay), where a small-time thug fences some gold bars he has stolen and then decides to find out what pleasures his money can buy. Journey with Bibhutibhushan Bandhopadhyay's silver-tongued salesman of medicated oil as he travels the trains around Calcutta, the city he loves more than anything else. And Nazir Mansuri's Melvillian "The Whale" transports readers to a small fishing village on the west coast of India, where an embittered sailor makes every whale he sees the object of his fury. Stories from nine languages and more than a dozen distinct cultures and regions -- from north, south, east, west, and even from India's remote northeast -- are brought together in this vibrant collection.